In sheer volume of passengers served, Atlanta International Airport dwarfs LAX, JFK, or Chicago O’Hare. It’s a transportation hub for the entire Eastern United States. 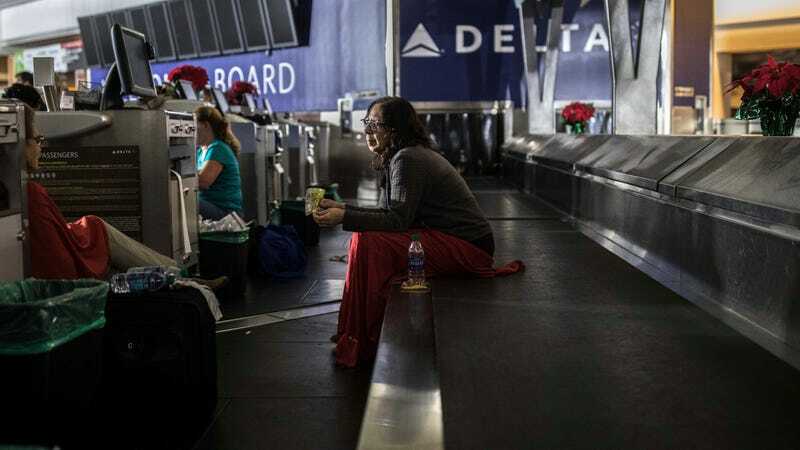 It also lost power yesterday, with no flights in or out for nearly 11 hours—leading to over 1,000 flights cancelled and passengers stuck in dark terminals or on the tarmac in grounded planes. According to the Associated Press, a fire at an underground Georgia Power facility was the source of ATL’s outage. It managed to damage two different substations, knocking out the airport’s primary and backup systems. The day of the outage also marked the 114th anniversary of the Wright Brothers’ first successful flight. My own trip from Lexington, Kentucky (for a very lovely wedding—congrats James and Melissa) back to New York was scheduled to lay over in Atlanta. Luckily there were seats left on a flight to Detroit instead, but many travelers, especially those already at Atlanta, were not so lucky. Power was restored around midnight, with TSA lanes opening back up closer to 3:30am. However, a tweet this morning from the Federal Aviation Administration noted that foggy conditions might further affect a return to normalcy for travelers headed in or out of ATL. Correction: This post previously stated Saturday was the 100th anniversary of the Wright Brothers’ first successful flight. It was actually the 114th anniversary.